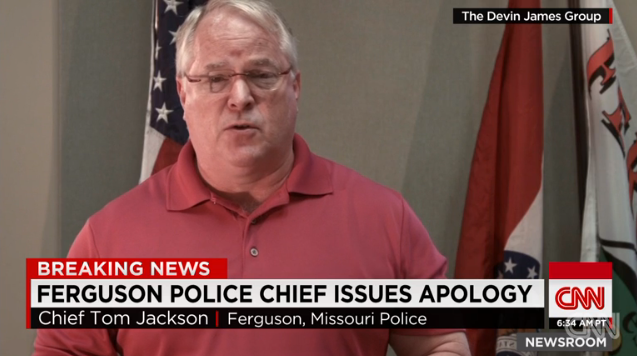 Ferguson police chief apology: Thomas Jackson makes statement on video. The Devin James Group is a “strategic brand marketing and communications” company. As many of you know my name is Tom Jackson and I’m the chief of police of the city of Ferguson. The events of the past few weeks have sent shockwaves not just around the community here, but around the nation. Overnight I went from being a small-town police chief to being part of a conversation about racism, equality, and the role of policing in that conversation. As chief of police, and as a resident, I want to be part of that conversation. I also want to be part of the solution. But before we can engage in further discussion of the broader issues, I think it’s important that we address the central issue that brought us here today and that’s the death of Michael Brown. I want to say this to the Brown family: No one who has not experienced the loss of a child can understand what you’re feeling. I am truly sorry for the loss of your son. I’m also sorry that it took so long to remove Michael from the street. The time that it took involved very important work on the part of investigators who were trying to collect evidence and gain a true picture of what happened that day, but it was just too long, and I am truly sorry for that. Please know that the investigating officers meant no disrespect to the Brown family, to the African-American community, or the people of Canfield. They were simply trying to do their jobs. There were many people who were upset about what happened in Ferguson and came here to protest peacefully. Unfortunately, there were others who had a different agenda. I do want to say to any peaceful protester who did not feel that I did enough to protect their Constitutional right to protest, I am sorry for that. The right of the people to peacefully assemble is what the police are here to protect. If anyone who was peacefully exercising that right is upset and angry, I feel responsible, and I am sorry. I’m also aware of the pain and the feeling of mistrust felt in some of the African-American community towards the police department. The city belongs to all of us and we all are part of this community. It’s clear that we have much work to do. As a community, a city, and a nation we have real problems to solve. Not just in Ferguson but the entire region and beyond. For any mistakes I have made I take full responsibility. It’s an honor to serve the city of Ferguson and the people who live there. I look forward to working with you in the future to solve our problems, and once again, I deeply apologize to the Brown family. The statement was posted on Vimeo by a company called the Devin James Group, a communications company that has reportedly been employed by the city of Ferguson since mid-August. St. Louis County prosecutor Robert McCulloch says he expects to finish presenting evidence in Brown’s death by mid-November to the grand jury that will decide whether to indict police officer Darren Wilson.